SilverTip Yacht Primer is a waterborne, two-part epoxy coating specifically formulated as a tough, below-the-waterline primer for marine topcoats. Though SilverTip Yacht Primer was specifically designed for use with System Three WR-LPU, it is compatible with most commonly available marine topcoats. It applies easily over fiberglass and carbon laminates, polyester or epoxy resin surfaces, and properly prepared wood, metal, and cementitious surfaces. In addition, it provides a smooth base for topcoating over epoxy or vinyester barrier coats. Yacht Primer offers performance equal to its solvent-borne counterparts, in corrosion protection, film-build, and sandability. In addition, it is non-flammable and contains no highly-hazardous (HAPS) solvents or heavy metals. SilverTip Yacht Primer can be applied by brush, roller, or spray. For spray application, HVLP equipment is recommended. Yacht Primer offers corrosion protection over aluminum or steel, but contains no heavy metals. When cured, it sands easily to a hard, smooth surface, to help give a high-performance topcoat, like WR-LPU, the best appearance. Performance equal to solvent-borne counterparts. Long 6 hour pot life. 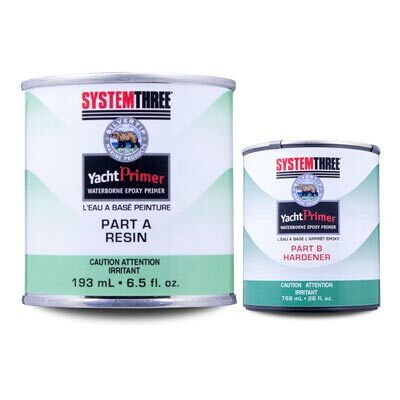 I bought System Three Yacht Primer after using the Ameron primer which I hated... This stuff mixed up nicely, covered well, had a good pot life and was easy to maintain a wet edge with, resulting in smooth uniform coats. It also cleans up with water which was a total treat. Expensive….but worth it in my opinion.